This map is a tracing either of the draft of Luffman's map or of a printed version of it that has yet to be located. The title features at top left below the city arms, with scale bar at bottom centre. 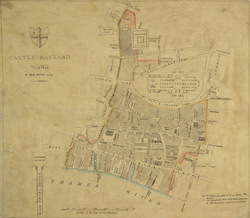 It also shows the ground plan of St Paul's Cathedral and Newgate market.